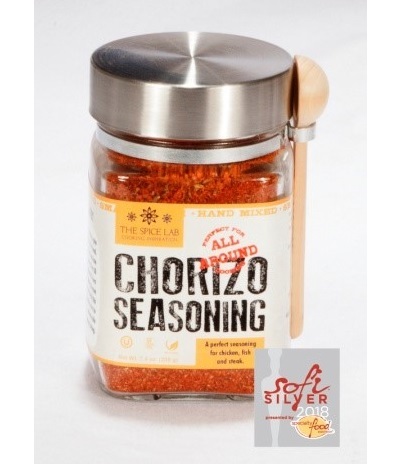 Pompano Beach, FL – Celebrating its 2018 Silver sofi™ Award for Spanish Chorizo Seasoning, The Spice Lab is showcasing a new packaging look and expansion of its line of premium seasonings and launching The Sugar Lab, a line of naturally-flavored sugars, cake decorations and cocoa mixes at the Summer Fancy Food Show, Booth #2571. The expanded seasoning line is OU Kosher, gluten-free and natural. They are hand-crafted in small batches with the finest quality ingredients and offered in a variety of packaging options. Each label includes “Chef Fiona’s Corner” offering tips and suggestions for using the seasoning and a cute caricature of The Spice Lab’s chef-in-residence, Fiona Tam Kennedy. Some of the more than a dozen new seasonings include Seattle Seafood, Spicy Brown, Hawaiian Hula, Everything & More, Spicy Citrus Mojo and Smoky Pecan. The Sugar Lab line of naturally-flavored sugars includes sweet and savory choices to add color, texture and taste. Use to decorate cookies and desserts, rim a cocktail glass, sprinkle on oatmeal or transform a glass of iced tea. The naturally-flavored sugars include Hibiscus Cinnamon, Lavender, Espresso, Sweet Tea with Lemon and more. A selection of cake decorations – Sanding Sugar, Sequins, Sprinkles, Nonpareils and Pearls – and cocoa mixes such as Salted Caramel, Amaretto and S’Mores also are available in the new line. With a wide selection of price points and packaging alternatives, the company can customize products for every customer’s needs. The Spice Lab’s extensive line of products includes artisanal salts, award-winning seasonings and BBQ rubs, spices, loose teas, sugars and a selection of gourmet gifts. Other offerings include Himalayan salt shot glasses, salt plates, stones and lamps, and bath salts.